People do strange things for love! Today we had the privilege of visiting an Abbey, built in the 12th Century by Lady Devorgilla of Galloway. 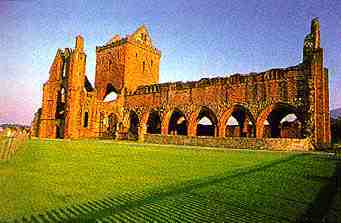 The Abbey is named Sweetheart Abbey and she had it built in memory of her husband John Balliol. 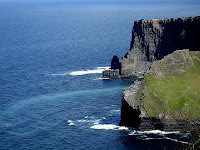 The story is that when John died, Lady Devorgilla was so heart-broken that she had John’s heart embalmed and kept it with her until the day she died. Now, if you visit the Abbey and stand just in front of the Altar, you can also feel that creepy sensation, that I felt today, as I stood above her burial ground. It just felt weird to be standing on the place where her body and John’s heart were buried together. Some people may think it was a romantic gesture, but it was a little strange for me. In truth, many people don’t understand Love. We don’t understand what drives others to do outrageous things for the ones they love. Just think of what Jesus did for us – He died on the cross for the one’s he loved – for the entire planet! That seemed bizarre to people in his day (and too many today) and yet his act of Love has changed our lives. Love may not make sense, but it sure can bring life! May we respond to God’s Love in such a way that seems real and life-changing for us. I have been reading through Proverbs again and it has been incredible to read the insights that Solomon shared with the world. Take a few of these thoughts from Proverbs 8 as an example. May the Lord bless you today - May God’s wisdom fill you with deep understanding and insight. Sometimes we imagine what something will be like. We even dream of the natural beauty of a holiday destination (for example) and then when we see it for the first time we judge our first impressions with the ‘created’ image in our minds. It either lives up to our dreams or not! Disappointment or sheer delight! I have to admit that most of the places we have visited so far, during our Sabbatical, have been awesome. They have lived up to our expectations and even more. This is what I imagine Heaven to be like. We have very little idea what it will truly look like, but the images we have from Scripture, give us a glimpse of the ultimate Paradise. I am convinced that whatever God has created heaven to be like, it will not disappoint any one of us. I definitely want to be there. How about you? I love those last few words... earth is drenched in God's affectionate satisfaction...wow! Take a look around you today and consider His affectionate satisfaction. God loves you - you are the work of His hands. He has drenched us in his love! I was walking down a little street near my sister's home, when I saw a Church with an interesting sign board. It had all the usual things on it, except when it came to service times, it said: "God Willling!" I had a quiet chuckle to myself. What does that mean? They only have services when God wants, or when the Preacher wants or depending if they haven't been raptured or what? I guess for the local members they know what this means, but if I wanted to visit, how would I know when the service times were? Don't get me wrong, I think that the sentiment "God Willing" is a good one. On some levels it shows a sign of surrender and humility. It indicates a heart that is willing to allow God to direct and lead. It rests in the peace that God will be with us in the future, no matter what! But, I just don't get a sign board that reads 'God Willing' when it comes to service times! Perhaps it's just me. What do you think? I will write again soon.... God Willing! One of the amazing facts of the Battle of Deville Wood was that every single tree, in that extremely large forest, was completely destroyed except for one! It only took 6 days of fighting, bullets, bombs and handgrenades to wipe out an entire forest. What helped that single tree to survive is a mystery - probably just a bunch of luck - but if that tree could talk today, it would tell a thousand stories. It makes me think that sometimes the world is a lot like the battle of Deville Wood. We are placed in a 'forest' of people and one by one we start to lose touch with these people. Life gets the better of them and they slowly start to disappear from our community or our circle of friends. In the end, we could be the Last Tree standing - feeling alone and with a bunch of stories to tell. After choosing not to blog whilst we travelled through Picardy (northern France), I feel as if I need to write 5 or 6 posts - we saw so many amazing things during our 5 days there. 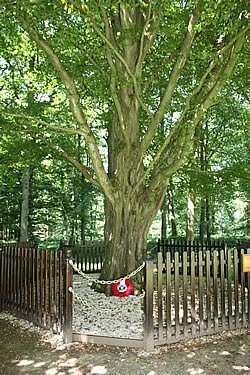 However, one of the most striking memories for me, will be our visit to the Deville Wood memorial. This commemorates the South African's who lost their lives in the 1st World War defending the Wood from the Germans. It is a deeply moving place and one that I will not forget for a long time. Of the 3200 (plus) South Africans who started defending Deville Wood, only 143 were still alive 6 days later. Such a tragic number of lives lost. 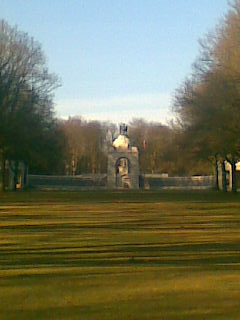 I couldn't help thinking of all the families impacted by these wars - how quickly we forget. I pray that you have a wonderful week. Don't take a minute for granted. We had the privilege of sharing in a service at the Pembury Baptist Church this morning. This is the church where Paul, Izzi and Sam de Villiers are now worshipping at. It was such an awesome experience and it was great to feel at 'home' in a place of worship far away from SA. The people were great and it really reminded me that we belong to a world-wide Christian community. It is the Holy Spirit who unites all believers, in Jesus Christ. Too often Christians focus on what is different about our particular 'take' on the faith, and we miss the richness of fellowshipping with the broader Christian family. Check out Pembury Baptist Church's great website if you have a moment - click here. As a family we head off to France in the morning, so watch out for my next blogpost in French!!! Au revoir..
Today we went to the Ashdown Forest with friends, Paul, Izzi and Sam de Villiers - it was such an awesome day. These are the forests where A.A.Milne got his inspiration for the classic kids books based on Winnie the Pooh. 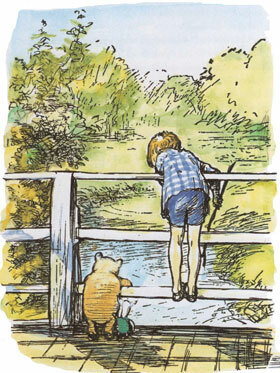 We stood at Pooh Sticks bridge, which can be seen in the attached picture, and imagined what it was like for Christopher Robin to throw the sticks into the river and watch them disappear onto the other side of the bridge. A trip to this part of the world does wonders for your imagination and sense of inspiration, and of course it takes you back to your childhood. It reminded me that God can use all of our life experiences to shape something for our future. We often can't see what these 'things' may be, but we need to trust in His awesome plans. Never underestimate what life experiences God may want to use, in order to inspire other people, or to do something for His glory. Sometimes we face things that require us to dig deep into our strength resources - this is when we need to rely on the Spirit of God to help us through these moments. On this weekend, which is Pentecost, may you know the strength of the Spirit of God in your life. God be with you in all that you are facing. I think that everyone knows the stress we went through in order to get our Schengen Visa´s, literally 24 hours before we were due to leave. After spending a week in Spain, I want to go on record as saying, "It was worth waiting and stressing for those visa´s!" We have had an awesome time over here. I haven´t learnt too much Spanish, but it´s a beautiful part of the world, even if we are only seeing a small part of it. It has made me realise again that something´s in life are worth waiting for - in fact, there are some things that are definitely worth praying for and then trusting in God´s timing for the answers. If you have been praying and waiting for something for a long time, don´t give up now. Trust in the Lord to come through at the right time - his time! God bless you abundantly today. Coming to a foreign country is always an amazing experience for me - it opens up my mind to reconsider how awesome our God is. The familiar works of his creation sometimes are taken for granted in the midst of our hectic schedules and busy lives. However, when we stop and take a look around, we are truly blessed to have such a creative and loving God. It has been a wonderful gift for us to see the creativity of our Lord these past few days. I invite you to take a look around you today and thank God for all the amazing things, people and places he has given to us. His grace is truly amazing. We have now come across to sunny Spain, in search of warmer weather and so far our search has proved successful. The weather has been more like South African Springtime and we are even getting a little tanned! What amazes me is the number of people from European countries who have also come in search of sun - they will go to great lengths to have warm holidays and I don´t blame them. What saddens me is that I wish more people would search for the real Son (Jesus) as much as we seek the sun!